The Clare Fire Department and City Police stepped up to help ensure Mid Michigan Community Action’s annual “Hot Wheels” Family Car Show was not swept away by high winds and rain showers. Unpredictable autumn weather fell upon the event with a calm sunny morning during event set-up at the Clare City Park, but the afternoon turned dark, windy and rainy just a few hours before the event started. “We always know this is a possibility for a fall event, but these winds were strong enough to pull four foot canopy stakes out of the ground,” Tracy Fair, Mid Michigan Community Action Family Involvement Coordinator, said. 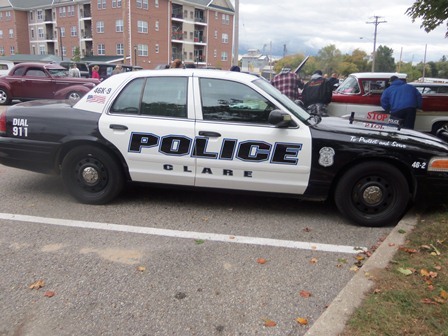 The Clare Fire Department and City Police have always participated in the event by bringing their vehicles for children and families to view. This year, they pulled their vehicles out of their bays so that the event’s activities could be moved out of the weather. Department staff also assisted in moving the event activities from the park to the vehicle bays. “The police and fire department really stepped up to make this event a success, despite the difficult weather,” Fair said. Approximately 200 children, families and volunteers braved the wind and rain to view over 21 cars, have some food, play games and learn about community resources. Local recording artist, Matt Moore also gave a live performance. The Clare Masonic Lodge provided the MI-CHIP service for children with families to develop a child identification packet in case of an emergency. They also provided a team to grill all of the hotdogs.